Your MST is making a big change. After two years of hard work and effort by a team of volunteers, we’re ready to present our plan to become a federally-registered non-profit organization. The Mycological Society of Toronto has evolved and grown since its start in 1973 as a small club. We're much bigger and more diverse, and our 513 family memberships now include almost 1100 people from all over the province. The needs of the MST as an organization have also changed and grown, and we need to change with them in order to better serve and safeguard our members, volunteers and directors. Now we need the participation of MST members to complete this process. In order to reach the finish line, we will be voting to adopt a new set of bylaws under the Canada Not-for-Profit Corporations Act. These new bylaws have been created to observe the requirements of the Act while taking into account the special qualities of the MST. The team has made every effort to maintain the spirit and values of the MST’s existing constitution in the new bylaws. We’re confident that this will build a foundation which will allow the Society to grow into the future and thrive for another 46 years. The MST that you’re used to won’t change. Membership fees will not increase, our yearly line-up of great forays, events and courses will continue, and our board of directors will still work hard on your behalf. This is a major event in the history of the MST. We’d very much like to have the support of as many members as possible. At this year’s Annual General Meeting on April 29th the board of directors will ask you to vote to adopt the new non-profit organization and its bylaws. This is an important moment for the MST and its future. We’re looking forward to seeing as many members, old and new, as possible at this year’s AGM! How will this affect MST members? Generally speaking, there will be no effect on MST members. Changes are at the level of the organization and the Board of Directors. The reorganization will not affect the MST's membership fees, programs and services, or daily operations. MST members will be governed by a new set of bylaws which will replace the existing bylaws and Constitution. What are the benefits of being a non-profit organization? Limited liability for members, directors and volunteers: members and directors of non-profit corporations are shielded from many types of financial and legal liability. Eligibility for government and private-sector grants. Access to technology (software and services) and programs for free, or at a discounted rate. The ability to own property and enter contracts as an organization. What will members vote on at the Annual General Meeting? At the MST's Annual General Meeting on April 29th, the Board of Directors will ask the membership to vote on a motion to approve the transition of the Mycological Society of Toronto (the "Unincorporated Club") to a new incorporated non-profit organization under the Canada Not-for-Profit Corporations Act, governed by the proposed bylaws. 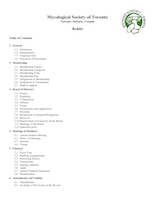 Members will vote to authorize the transfer, convey, grant, and assign all of the rights, title and interests of the Unincorporated Club in all of its assets, properties and rights in favour of the corporation of "Mycological Society of Toronto" the incorporated successor to the Unincorporated Club, followed by the winding up of the Unincorporated Club. Provided that the members in attendance at the AGM vote to confirm the reorganization and adopt the proposed bylaws, the change will be effective as of April 30, 2019, at 11:59 pm. Where can I read the proposed bylaws? Who was involved with this project? The idea of non-profit incorporation was initially proposed in 2017 by Kevin McAuslan (MST President 2013 — 2017). Kevin and a team of board members continued subsequent work on the project, with help and consultation from key senior members and former directors. Assistance from outside parties was occasionally required.